Lincoln has updated its luxurious full-size SUV for 2010. This car used to be a big rival for Cadillac Escalade, but as the Caddy is constantly improving its position, the Navigator seems to be satisfied with its small market share. 2010 Lincoln Navigator is powered by a 5.4-liter V-8 engine featuring Flex Fuel (FFV) capability to give owners more options at the pump. With three valves per cylinder and variable cam timing, the 5.4-liter engine delivers a balance of refinement and muscle. Rated at 300 horsepower and 365 pound-feet of torque, Navigator can tow up to 9,200 pounds when properly equipped. at 2010 Detroit Autoshow Lincoln revealed a new version of their MKX midsize luxury crossover which has been facelifted in order to look a bit less awkward! You see the previous model was a truly hideous car with the biggest mouth ever fitted to any car! But the 2011 MKX is refreshed inside and out and it also comes with a new engine as well as the new and amazing MyLincoln multimedia system. The new car gets a new 3.7-liter Duratec V6 engine featuring Twin Independent Variable Camshaft Timing (Ti-VCT) technology. Mated to a six-speed SelectShift Automatic transmission it has 305 hp and 280 ft.-lb. of torque, and is said to do 25 mpg, thanks to new systems like the Aggressive Deceleration Fuel Shut-Off and smrt battery charging. Inside you are well treated with the usual blend of leather and wood trims and you also get a whole lot of high-tech toys and safety features like Adaptive Cruise Control and Collision Warning with Brake Support and Blind Spot Information System (BLIS) with Cross Traffic Alert. But the best new feature with this car is indeed the multimedia system which is developed by Ford and contains LCD touch-screen monitors in the console and instrument panel. This system turns the car into a big 3.7 liter laptop! It really has great capabilities. The Lincoln Navigator was one of the hottest vehicles around in the late 90’s and early 2000’s when gas was incredibly cheap and SUV’s meant prestige and status. While the Lincoln Navigator may be hated by environmental types, for those with large families or who enjoy ultimate luxury and a nice brand name image, you still can’t beat the 2009 Lincoln Navigator. What the Lincoln Navigator does best is offer a full size SUV experience. Besides, the sporty image of the Hummer, if you want a luxury American SUV, the Lincoln Navigator definitely hits its mark. The 2009 Lincoln Navigator comes with a huge 5.4 liter V8 engine that delivers a decent enough 310 horsepower. The Navigator comes in two main flavors- a 4×2 transmission or a 4×4 transmission that offers plenty of luxurious fun for those enthusiasts that like to hit the trails in style. While the exterior is similar to last year’s model, there are still quite a few features that are worth noting including, the power liftgate, seats that are heated and cooled, power folding 3rd row seating, a sound system that is THX authorized, HID headlights, trim made from genuine wood and plenty of safety features including: anti lock brakes, stability control, anti roll control, the ability to monitor tire pressure, front and rear parking sensors and of course a rear view camera for backing up. In addition, there are side curtain airbags for all rows of seating. Besides all of these features, some new items to mention for 2009 include a V8 engine that is E85 flex fuel capable. However, fuel efficiency is low as expected with numbers such as 20 mpg on the highway and 14 mpg in the city. 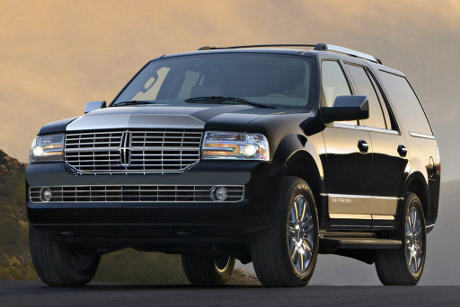 The 2009 Lincoln Navigator also is pretty pricey weighing in at about $55K.